There are lots of different views about this. Some residents in West End opposed the project saying it would be noisy and too expensive. 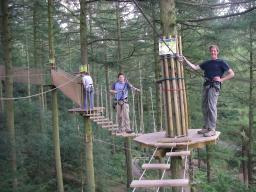 Go-Ape say that the course would help create jobs and that traffic would be limited as participants book timed slots in advance. They say it would be fun too! The Local Area Committee listened carefully to all the views expressed about the plans and I also took note of comments made by local residents responding to. It seemed to me that the majority of people I spoke to about the application supported the plans. What's more, major consultees like the Environment Agency, the Wildlife Trust and Natural England considered the environmental impact of the plans would be acceptable and might even improve biodiversity at the neighbouring River Itchen. On the evening the planning application the main points were does this proposal adversely affect the wildlife, the other park users, the neighbouring properties, or the neighbouring businesses. If the committee adjudged that they were not adversely affected then it should be passed as a valid application. The Go-Ape application was the main item on the agenda and full discussion on all the points was had, during the mammoth meeting that lasted from 7:00 pm to 11:50 pm, at the end of which a majority of committee voted in favour of the planning application. "After a full debate on all the points I came to the conclusion that the proposed new facility would not be of adverse affect to the wildlife, users or neighbours of the Country Park, indeed I believe it will actually prove to be of positive benefit to park. It will encourage a wider range and great numbers of people to experience the delights that our country park has to offer."